Mobile World Congress is here once again and that can only mean one thing: it’s time for the TechRadar MWC awards. Less glamorous but more accurate than the recent Oscars, these are the awards all the top tech firms attending the show in Barcelona want to get their hands on. 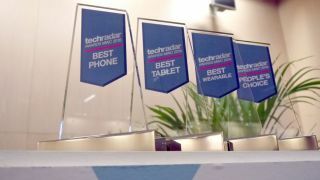 This year in particular was hotly contested and our team of TechRadar judges spent hours deliberating to make sure the best products on show at this marquee mobile event got the recognition they deserve. Our Reader's Choice also gave you the chance to vote for your favorites at this year's MWC - so here's who emerged victorious. "2017 was a special year for the TechRadar Awards at MWC 2017, as it was the first time we saw such a spread of choice in the top categories," said TechRadar's Global Phones, Tablets and Wearables Editor, Gareth Beavis. "LG impressed us all with its rebooted design and more sensible feature set, but combining it with an eye-catching display on the front that will be a useful weapon in the fight with Samsung and Apple. "The Sony Xperia XZ Premium was also an impressive phone that shows Sony still knows how to make a great device. Samsung's tablets impressed as we finally got the rebooted Galaxy Tab we've been expecting, and the Huawei Watch followed the welcome trend of more sporty smartwatches as consumers look to get fitter with wrist-based tech." We were impressed by the original Huawei Watch,, so the pressure was on for the Huawei Watch 2. Fortunately it's lived up to our expectations, as it's gone for a more sporty look than its sleek predecessor, which could be divisive. However, it's also lighter and packing more than enough significant new features to make it an appealing option for anyone looking to move into the second generation of Android Wear. This hearable is still in the concept stages but we were impressed to see Sony working on a wearable that not only looks good but has the potential to be really useful. We're excited to see more. You were all clearly as impressed with the new Sony flagship's 4K HDR screen tech as we were – it came out on top in our Reader's Choice poll. Taking second place in our Reader's Choice poll is the winner of our Best Phone and Best in Show categories, the LG G6. Samsung has lifted the award for best tablet thanks to its new addition to the Galaxy Tab family. A solidly-designed tablet that comes bundled with the new S pen, it's the Android alternative to the iPad Pro. Samsung has come in strong with the tablets at this year's show. The Galaxy Book looks set to be a refined and improved Tab Pro S, and with a bundled S Pen and keyboard, combined with the smart Samsung Flow, this was a tablet that impressed the judges. With the G6, LG has dialed back the innovation and created a solid smartphone that takes things back to basics and does them well. It's in a strong position to perform well in the 2017 smartphone wars, and the 18:9 ratio display dominates the front of the phone to look really impressive the second you lay eyes on it. A phone that offers fantastic all round value, the Moto G5 Plus is only going to improve Motorola's already good reputation in the budget phone market. It combines strong specs with an attractive metal body to bring exceptional value to the market. Once again, Motorola has served up another budget winner... and it just keeps getting better year on year as cutting-edge features filter down. A double award for LG in 2017 at the TechRadar awards, with that huge display and refined design making it a firm favorite and an easy winner this year. After the less-than-stellar performance of last year's G5 we were hoping LG would deliver a more refined mobile experience, and with this rebooted G6 it's done just that. Sony has created a phone with great potential, one that makes the most of its huge screen with 4K and HDR capabilities. This powerful handset - one of the first to launch with a Snapdragon 835 chipset - has some of the most advanced screen technology on any smartphone and that deserves recognition. It's also going to be one of the fastest at downloading, with the capability of sucking down 1Gbps of data on the go. That means the buffer bar should be a thing of the past if you're on the right network.